Part 1’s collection of essays include pieces by well-known voices such as Jay Dolmage, Jen Almjeld and Kristine Blair, who address such topics as establishing and negotiating identities in text and visual media and the importance of acknowledging the body when engaging with media that privileges the “normal” body. Jen Almjeld and Kristine Blair describe Almjeld’s conflicts with her dissertation committee as she justifies her topic: examining “the rhetorical processes of identity construction within female users’ MySpace profiles” and her use of feminist research methodologies (97). This essay examines the pushback that Almjeld navigated with a dissertation that recognized contextualized research and researcher bias (Almjeld herself had a MySpace account and took this into account in her dissertation). Almjeld and Arola note wryly that “judging from the resistance the project received, it seemed the desire to focus on validating feminist writings historically and theoretically was the correct one” (98). Through Almjeld’s dissertation, Blair discusses the effects of establishing a technofeminist research identity and its implications to the traditional research methodologies. Almjeld and Arola conclude their discussion with “some questions about the ways new media research in particular is remediating traditional notions of research and researcher” (107). The questions attempt to foster consideration of a variety of research methodologies as meaningful, valuable modes of research. In another essay, “Writing Against Normal: Navigating a Corporeal Turn”, Jay Dolmage introduces the relationship between HCI (Human Computer Interfaces) and the physical human body, and the normative restrictions that HCI’s impose on the body. This normalization occurs in composition pedagogy as well; according to Dolmage, “dominant pedagogies privilege those who can most easily ignore their bodies” (Arola and Wysocki 111). Dolmage argues “that, in fact, ignoring the body has serious consequences. As we compose media, we must also-always-compose embodiment…. In this essay I will critically investigate the ways embodied pedagogy can be developed without invoking normative models of embodiment” (Arola and Wysocki 110). Dolmage explains that media invoke normative models of embodiment and presents some potential pedagogical and technical solutions for composing that “affirm all bodies”, not just the normalized body (Arola and Wysocki 110). These essays, like others collected in Part 1 (“media=embodiment”) approach the topics of media and embodiment through a variety of theoretical lenses. Some essays in Part 1 have interesting points of intersection, such as “How Billie Jean King Became the Center of the Universe” with “Information Cartography: Visualizations of Internet Spatiality and Information Flows”. These two essays each address the “space” of the Internet and how information is grouped together. These essays share a “mapping the internet” thread, offering readers different lenses through which to engage with the Internet as users and composers. 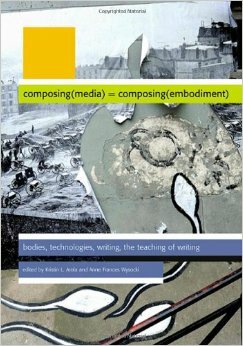 Similarly, Matthew Johnson’s “Authoring Avatars” and Jen Almjeld and Kristine Blair’s “Multimodal Methods for Multimodal Literacies: Establishing a Technofeminist Research Identity” address the issue of identity construction in relation to composing analyzing new media. These essays focus on Internet users’ deliberately constructed and performed identities online in order to examine new methods of composing identity. Heuristics are provided at the end of Part 1, which align with Arola and Wysocki’s goal to offer new methods to teach composing with a focus on embodiment. These heuristics “ask students to consider the literacies and bodies encouraged by and required for media production and consumption” (Arola and Wysocki 128). While Part 1 (“media=embodiment”) provides an interdisciplinary look at media’s shaping of our embodiment, the essays themselves exist only adjacent to one another, and are only addressed as a unit by the heuristics provided at the end of Part 1. Since these connections appear tenuous at best without closer examination, students will inevitably miss valuable points of intersection between the essays and the fields of study they represent. While the activities at the end of part 1 address identifying the ways media shapes our embodiment, the activities do not synthesize the essays explicitly for students or teachers to examine. Without synthesis, readers and students lose potentially significant, valuable connections between media, embodiment, and a variety of fields of study.